Bit Of Byrd: Go VOTE! Whether you like or dislike the current administration you have the right to go and make your voice heard. This post isnt about who I cast my ballot for or for who you choose but instead the act of choosing. I went and early voted last week and to be honest it was the first time I have voted out of the 3 elections I have been eligible for. Maybe it is a matter of being older or maybe I am just more in tuned to what goes on in the world. But this is the first vote I felt mattered. So leave me a comment. Tell me that you voted. I am not worried about who. We will find out who wins at the end of the day. Remember this is your chance to make your voice heard. 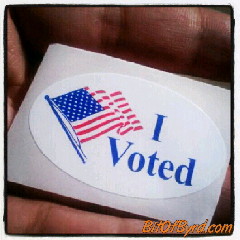 If you dont vote for what you want you have little room to voice later what you wish would have happened.